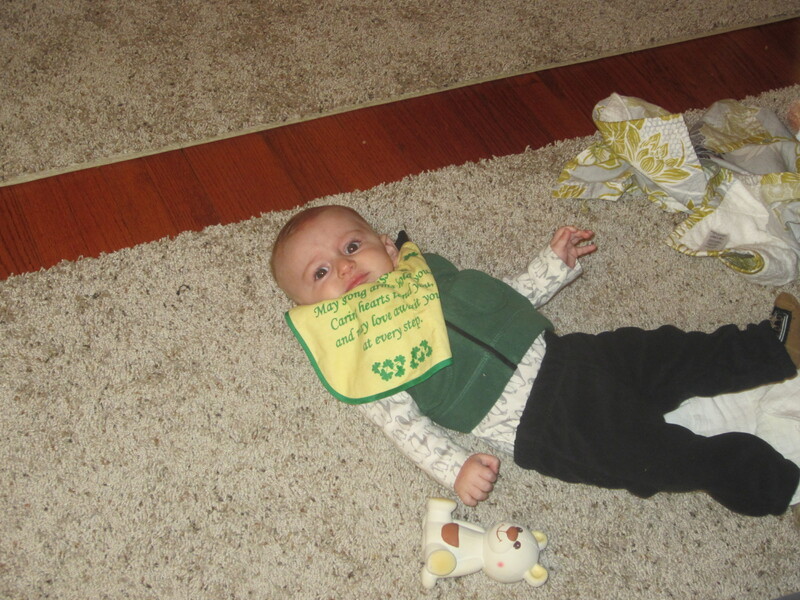 Reenacting with babies isn’t easy. Well, of course its not. That’s why spectators look at us like we’re nuts. That’s why that whole “Is that a real baby?” question even exists. It’s tough. So how do we make it a little easier? Thomas and I have spent hours discussing this…usually on the way home from difficult reenactments where I admittedly fell into despair a couple of times, or more, during the event. I mean, let’s face it…taking care of the kids is a lot easier at home. And when you’re so busy with them that you can barely enjoy the reenactment yourself, what’s the point? The point is family. Sure, giving our kids history is great. There are so many hobbies and crafts you can get into as a reenactor, such as sewing, woodworking, historical costuming, cooking, researching, music playing, tomahawk throwing, and much, much more. Reenacting is what you make it. But even with all of that…the real reason we make reenacting a priority is family. Granted, I have a lot of family out there. My husbands’ parents, his siblings and their spouses (and this year our new niece), as well as my sisters and occasionally brothers and, maybe once a year, my dad, all reenact. But it’s more than just that. We have so many close family friends out there whom I count as aunts and uncles to my kids. The NWTA is a close bunch of people because we really do spend a lot of time together doing something we all feel is important. My mother-in-law and I had a conversation about this in the fall. She remembers how hard it was when they started reenacting, trucking three kids and a baby to reenactments. It seems that the events themselves got a little easier as the kids got older, but older kids brought challenges of their own. Making reenacting a priority wasn’t always easy, but she’s very happy she did. This past Christmas, I discovered that she didn’t forget our conversation. She and my father-in-law searched high and low and found a nice, big washbasin for me to use this reenacting season. That should make the dish washing at reenactments a bit easier, as well as provide a play tub for the toddlers when it gets really hot. As if that wasn’t awesome enough, my-father-in-law built me some new camp furniture. 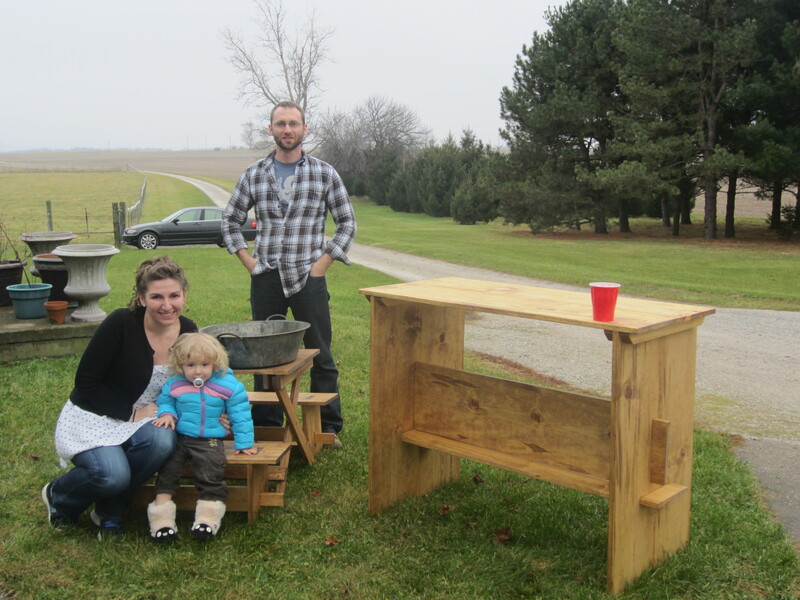 He made a fold-up table and two benches for the kids, and he made me a kitchen prep table that I’m just thrilled about. Worthington’s Company has one, and it seems to make a world of difference. This way, we’ll have a place to prep the food and serve it, leaving our table space for eating and merriment. Ginny has moved from a crib to a toddler bed with surprising ease, and my parents got her a sleeping bag for her birthday (yay!). That means Jack can have the pack-n-play, making tent camping a little easier. And I think we’re going to look into getting some cots. I know it’s cheating, but I’m not getting any younger. Plus, now that we are in the townhouse with a garage, we can keep a small trailer. Thomas put a hitch on our car and he and his dad did the wiring. Now our little Subaru can pull a trailer, and if we need to, hold a car roof cargo box (or topper, or clamshell…whatever you want to call it). With all that, the Subaru looks ridiculous, but whatever. We can bring our own stuff to reenactments, and it can all come home with us. We had to rely on a lot of favors after we had Jack– there was no room in the cab of the car anymore…not with the extra car seat and all the extra stuff. With the trailer, that’s no longer the case. Do I expect that this reenactment season will be a piece of cake? Of course not, but maybe my responsibilities will be a tad easier. I know with my kitchen at home that the right tools make the job far more enjoyable. Why should it be any different at events? I think that, for me, accepting some sucktasticness was helpful. Like “this is different than before and I will not be sleeping this weekend and I can’t do everything and that’s ok.” We’ve got each other to lean on, that helps! Love the “counter height” piece! We are going to ROCK OUT vegetable chopping this year. Watching both of your families the last 2 years has really helped us prepare for what to expect come fall. And definitely having everyone around willing to lend a hand is what turns a crummy weekend into a ok weekend.